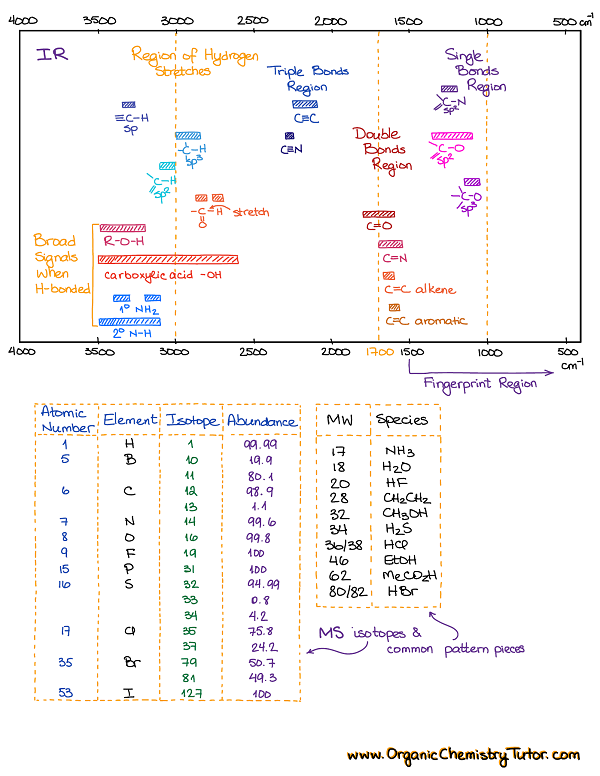 Good spectroscopy notes and cheat-sheets are a must-have for any organic chemistry student out there! Total 14 pages of detailed notes on all major types of spectroscopy that you’re bound to see in your organic chemistry course! Spectroscopy is taught in every sophomore organic chemistry class. So, yep, spectroscopy is one of those absolute must-know topics. While some professors include spectroscopy in the first semester organic chemistry, and others in the second, you’ll come across is anyways! You’ll also need to know spectroscopy for the MCAT, PCAT, DAT, etc. And experience shows that there are only two things that will help you ace this topic: constant practice and a solid set of spectroscopy cheat sheets and reference tables. How to study spectroscopy topics? Many instructors give some sort of spectroscopy sheets to their class. And let’s be frank here, those sheets are usually pretty bad! You don’t need a laundry list of every possible chemical shift or IR stretch! I kid you not, I once had a student who’s instructor gave them 17-page long table with NMR chemical shifts! How are these spectroscopy cheat sheets better? I wrote this set with a student in mind and how students use spectroscopy cheat sheets. I color-coded them so they are very easy to navigate. Each topic only contains the essential chemical shifts and IR stretches that you need to solve your spectroscopy puzzles and no unnecessary fluff! I also give you the shifts and stretches in the table and visual forms to help you relate with where to find those signals in the spectrum. Finally, each topic has a brief and carefully written theory portion to give you just what you need to ace your conceptual test questions. When you’re working on solving the spectrum, have your tables ready. If you have the IR, then have the IR table handy, if you have an NMR spectrum, pull up the NMR table. Then, go through each signal in NMR and major signals in IR above 1500 cm-1 and list them on a piece of scratch paper. Identify the types of bonds and functional groups you have in your molecule based on the IR stretches. Do the splitting pattern analysis (see the notes in the HNMR sections for how to do that). List out your puzzle pieces and put the molecule together. Move to the next problem! Since spectroscopy requires a lot of practice to build your puzzle-solving skills, you wanna commit yourself to solving at least 2-3 spectroscopy problems daily. Make it into a daily routine. When I was a student myself, I used to take a 45-min train trip to and from school every day. My train ride was the time to work on the spectroscopy problems. So, while my peers were chatting, reading magazines, or window-gazing, I’d pull out my spectroscopy reference tables, a few spectra printouts, and work on those. By the time the finals rolled in, I’ve solved staggering 700+ spectroscopy problems! Needless to say, the spectroscopy questions on the exam took me no time or effort to solve. There are plenty of sources online nowadays where you can get practice problems. Here’s the one I like. I often include spectroscopy problems in my tutoring meetings with my students. So, if you’d like to go over spectroscopy problems you have, send me a message!